Pattaya Environment workers said they are collecting about two tons of fruity leftovers a day. Fruit season in Thailand again is yielding a bumper crop of garbage as careless consumers simply toss peels and skins on the side of the road or down the sewer. Pattaya Environment workers said they are collecting about two tons of fruity leftovers a day, sweeping many of the skins off the road, beaches, from flower gardens and wherever inconsiderate snackers throw them. Environment Department manager Sanya Thabthimsri said city officials up to the mayor’s office are aware of the problem and have contacted a disposal firm that specializes in organic waste to handle the mess. The city also is putting specially marked fruit-trash cans in markets and areas where fresh produce is sold, as well as instructing vendors to advise their customers to dispose of peels and skins properly. 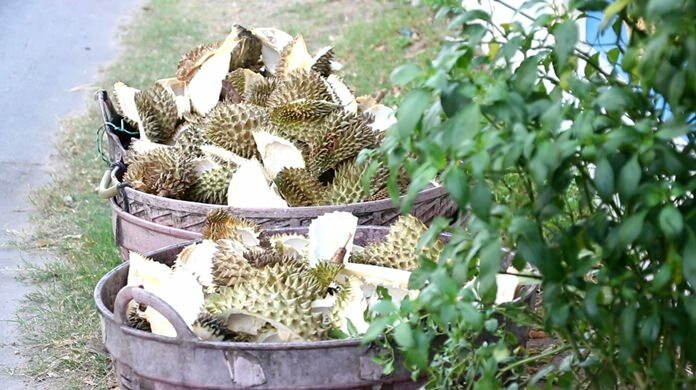 Authorities warned fruit fanatics that if they are caught littering they can be fined up to 2,000 baht.